Yesterday I mentioned I’d be having two meals. That didn’t happen — the entry into Isparta was a little sparse, restaurant-wise. So dinner last night was a bag of chips (crisps, for my British readers), some chocolate chip cookies, and some peach juice. Breakfast this morning was marble cake. The real meal had to wait for lunch. 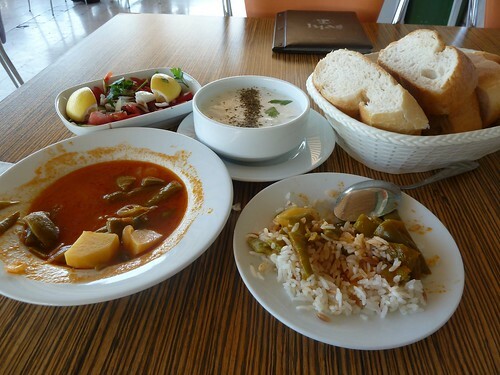 Here is taze fasulye (fresh green beans stewed with potatoes in a tomato-based broth), pilav (rice), cacik (cucumbers and mint in watered-down yogurt), coban salata (diced tomatoes, cucumbers, and onions), and bread. I was so hungry I attacked the food and was almost half done before I remembered to take a photo. I ended up almost finishing that entire basket of bread, but I got called over for tea at another table.